Cathy Jean (Powers) Strombom died the 1st of December, 2018 in Seattle, WA. Cathy was born in Bremerton, WA, on November 4th, 1949, to Paul Powers Jr and Carolyn Powers. She grew up in Port Orchard, WA with her sister Deidra. Cathy went to Whitman College and majored in mathematics. She met her soon-to-be husband David Strombom while at Whitman, and they were married June 17th, 1972. 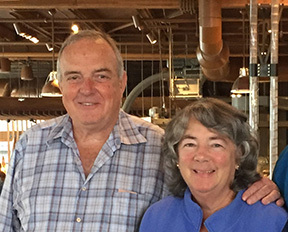 After graduate school in city planning and transportation at Harvard and the University of Washington, Cathy and David had multiple work and travel assignments overseas including Morocco, Iran, India, Turkey and Pakistan. Beach time every year was in Mazatlan, Mexico, always with a big group from her family. Cathy worked 34 years with the Seattle office of Parsons Brinckerhoff (recently incorporated into WSP), where she was a Vice President and headed the planning team that did much of the early work on major transportation structures and systems on the West Coast and in Hawaii. Cathy was highly involved in two leadership development groups in Seattle: Women’s Transportation Seminar (WTS) and Leadership Tomorrow for training young professionals. She died in capable hands at Swedish Hospital, having run the course of treatments for multiple myeloma over the past two and a half years. A memorial service will be held on Saturday, January 12th at 2:00pm at Lakeside School Wright Community Center, 13510-1st Ave NE, Seattle, WA 98125. She died very peacefully, surrounded by family, loving this life.